With the breakup of the short-lived empire of Alexander the Great, Judea was part of the Ptolemaic Kingdom until around 198 BCE, when it was conquered by the Seleucid Empire. 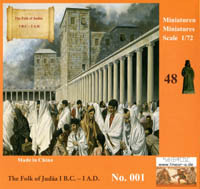 From 167 to 160 BCE a revolt by Jewish dissidents under the Maccabees eventually achieved independence for Judea as the Empire disintegrated, but in 63 BCE the Roman Republic conquered it and set it up as a client state, first under the existing Hasmonean dynasty and then (from 37 BCE) under the Herodian dynasty. This was the state of affairs at the start of the first century CE, and would continue until well into the second century, though there were periods when Rome ruled the province directly. The box claims just a two year period, but of course civilian fashion was extremely slow to change so these figures can represent a far longer period than that. The box also specifically identifies each piece in the set, so we will take each one in turn here, using the name given. Jew. This man wears a long robe, a cloak and a shawl over the head. He can be identified as Jewish by the phylacteries that he wears - the shel rosh on the forehead is clearly visible, and the straps for the shel yad can also be made out on his left arm. Like the rest of the poses in this set, he is doing nothing in particular. Jewess. This lady wears a long robe and also has a shawl over her head, while she carries a small bag or purse. Hiker. We think this a poor description for this man. The word is only a couple of hundred years old, and really means someone walking for recreation, when that is not likely here. 'Traveller' would have been better, but whatever you call him, this figure is dressed in two robes and carries a staff and a bag or skin of water. Although he has his left heel off the ground, his posture shows no sign of movement. Beggar. Begging was a fact of life then as it still is, and any town would have had such people begging for alms. This man has either lost both lower arms or is a bit of a messy sculpt, with some problems particularly regarding the robe around his left leg. His woes are compounded by seemingly having lost his right eye. If he really had lost both lower arms then you wouldn’t think he could survive even by begging, which leaves us thinking this is quite a poor sculpt to an admittedly challenging pose. Farmer/Merchant. As a farmer this man would have to get around his land and reach market, and as a merchant he may travel very long distances, so either way possession of a donkey would be very handy. This man, again dressed in a simple robe, holds a stick with which to 'encourage' the animal that he is riding, but is otherwise unremarkable. Donkey. Mode of transport for the above farmer/merchant. The pose is very good and natural (not often we can say that of a quadruped model), and the animal carries three bags of goods presumably destined for sale. Merchant. This man, in what looks reasonable costume, carries something over his shoulder. We don't know what it is, but this figure has the distinction of being the only human in the set visibly moving. Man with Prayer Shawl and Phylacteries. Another man in multiple robes and with a shawl over his head. This time he is praying, and he too wears the phylacteries, visible only on the head as the arms are covered. Boy with Phylacteries. Similar to the previous figure, only younger and with the shawl off the head, but he too wears the phylacteries. Like most of the others he is standing still and inactive. Priest. Although this man is a priest, his costume is not so far from the normal outdoor garb of the average man. He wears a long robe tied with a corded belt, and a suitable cap, so fairly simply dressed. High Priest. As you might expect, this is the most interesting figure of all. He wears the same priestly robe as the previous figure, but due to his station he also wears a more impressive cap, another, outer robe, and an ephod, which seems to take several forms, but here has been done as a sort of waistcoat tied with a sash. Another mark of his rank is the square breastplate he wears on his chest, which is called a hoshen and is decorated with 12 precious stones to represent the 12 tribes of Israel. All these vestments are accurate for a high priest, and mark this figure out from the rest. All of the costume looks quite accurate, or at least is typical, though it is noticeable that there is no one wearing a simple tunic or otherwise looking like a workman or just dressed for a hot day. The poses are mostly quite inactive, which makes them work better in a market or some other meeting place, since only the merchant and donkey seem to be moving. You would not expect as much life and movement as you would see in a set of soldiers in battle of course, but a little more movement than this would have been nice. The sculpting is very good, and certainly in a different league to the offerings produced under the Linear-B label. These are proper sculpts reduced down and done in a steel mould, and the level of detail is very good. On such figures the way the clothing hangs is particularly important, and we thought this had been done very well here. We have already mentioned the problems we had with the sculpting of the beggar, but the only other negative comment is on a couple of the faces, particularly that of the mounted farmer, which look slightly strange. However there is very little flash, and the fairly hard plastic used to make these figures is easy to trim and work with. Bases are small, but all are adequate as the figures have no problem standing. The donkey is a pretty small example, which is fine, though it means the man's feet are not far above ground level. More worryingly the load the animal has been given (which is moulded with it) means the man is sitting well forward - virtually on the donkey’s shoulders, which is not ideal. The overall effect is to make you wonder how the donkey is managing to cope with the weight of its burden, and how the man is avoiding slipping forward onto the donkey's neck. Compared to the action sets we usually review this is a refreshing change of pace, and from the available evidence we can have no concerns over accuracy. Very well sculpted and finished to a high standard, our little quibbles over sculpting should not put you off what is a fine set that delivers what it promises in the title, even if that is somewhat quaintly put!